You can watch the show online (maybe UK only) at.. I'm thinkin that this topic was worthy of its own thread. What a treat to see those Dusty Outfits, but what a travesty that they were sold so cheaply. I'm sure that they would have fetched at least £1000 at Dusty Day. Thanks for the link, I'm gonna start giving that programme a whirl!! He has I believe some of her dresses too. I wonder who bought these jackets. It would have been nice to have known about the auction on line beforehand. He paid £800 for them so someone got a bargain buying them for £750. His charity was an old artists fund, so in that sense they will benefit, but I too feel they would have fetched more with abit of publicity on fan sites. Yes, I guess as the items belonged to Bobby Crush he's entitled to choose the Charity, which looks like a good one.. I suppose if the buyer was a Dusty fan theres a small chance of those things appearing at the Dusty Day Auction.. Thank you for the Link Carole,it must be the only one I have missed in a while! Typical! I'm sure youre right and it would have made more at the DD auctions. Love this one with the butterflies. I think it deserves it's own thread too but Corinna is away at the moment and I'm not sure anyone else knows how to move the posts! Soon as I saw that butterfly jacket at the auction, I loved it and I think the black outfit is great, I'd wear that now! Not that I personally would have been able to afford them, but it is such a pity they didn't come to Dusty Day. Even if the money had gone to his chosen charity instead of ours, I'm sure they would have gone for so much more. In the programme they talked about specialised auctions and getting in touch with her fan club etc. Can't see that they did that, we're the nearest thing to a fan club now that the Bulletin has closed. I am gutted, I would have gone to a thousand, and who knows how much more had it been on dusty day, but then again that bloody woman would have outbid me yet again, cant blame her really, if she has the cash, i guess i would do the same if i could. But, as well as all this, they are about to, or just have, filmed a "flog it" special in henley. I emailed the bbc with a suggestion that they may want to make their middle bit of the show where they do something relevant to the area for ten minutes or so, about dusty, i gave them a rundown but never heard back and then i forgot about it. all these missed opportunities!!! such a shame that he didnt put them to the Dusty Day auction and maybe split the money between his charity and Dustys, but then he bought them in the first place so its up to him how he disposes of them later and its a good cause again. I wish all her stage clothes were on display somewhere instead of scattered all over the place. dont know if any of the Brits watch country file Sunday evenings,but it was from Berkshire today. they were on the Thames and they went to Hurley,next to where the frogmill house Dusty rented is. they went to a boatbuilders yard and showed Henley with a quick glimpse of St Marys Church in the back ground. Sometimes watch Liz, but missed this one. The notebooks are different Clive, thank you. I had seen the others you put on above these, but not in B/W, so again thank you. I was watching a programme on vintage tv on the weekend, it was called Solid silver sixties. music clips of this show and chats with Chris Farlowe, Dave Berry and Tony Crane from the Mersey beats. My biggest influence without a doubt. She was my idol. I saw her perform at Mr. Smith’s in Manchester years before when I was still a student, and I met her years later in the 80’s when she performed at Greg’s Blue Dot in Hollywood. She was every inch a lady, and an incredible performer. 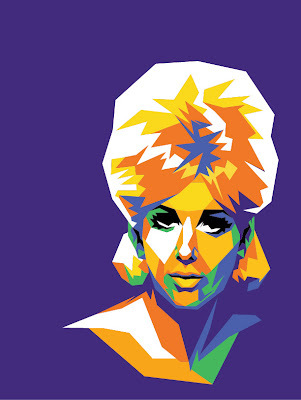 I would love to do a tribute album to Dusty Springfield if I ever get the chance. Her recording career was absolutely phenomenal. She could and did sing in about every style you could think of. Did you write anything for her? Yes. Well, I tried. But it was very difficult to get to her. I wasn't old enough to go to Mr Smiths, you had to be 21, so lucky him Cas and I stood at the end of the road in the hope of seeing Dusty arrive but we never did. It was a bit of a seedy area back then. thanks for the link Carole and the flyer from Greg's Blue Dot. Just looking back at an old copy of the Bulletin( no 44). Fred Perry had some interesting recollections about Dusty's appearance at Greg's Blue Dot. He mentions he had some great photos from that night, I wonder will they ever surface. 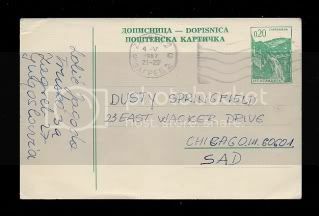 This is kind of sweet, a card sent by a fan in Zagreb to Dusty in 1967 when she was appearing at Mr. Kelly's nightclub in Chicago. Very sweet postcard. I hope she got her autograph. You must have magical powers Cor, I tried to copy that, along with the picture of Mr Smiths but it wouldn't let me, hence the link instead! I worked around it. Pity there's not much else about Dusty there! Nice little snippet, thank you ladies. "Dusty Springfield persuaded Vicki Wickham, one of the show's producers, to do a Motown special that she would introduce." "the Pet Shop Boys struck gold by hooking up with arguably the most revered vocalist of her generation – Dusty Springfield. Their single together, What Have I Done to Deserve This?, was a win-win situation: the band got kudos for enticing Springfield into recording what was the classiest record the PSB ever made, her career got a new lease of life, and it reached No 2." Thanks Clive, nice to see Reading their list of top 50 Pop recordings of the last 50 years, good to see that Dusty was one of the few to make the list twice. While looking through the site, I saw this review of the South Bank Show from a few years back, can't remember reading it before (though I may have), think it's interesting and deserved a showing here. Thank you very much for the review Carole! That was really interesting to read! Producers often say stuff like that to hot writers, more as a courtesy than a real request. But Wexler was serious, and Hurley and Wilkins knew it. Wexler loved the song. Two or three weeks later, he cut it with Aretha, and at the time he thought it didn’t fit the album they were doing. It was too gospel-sounding for her, but he was planning to record Dusty Springfield in Memphis. In early 1968, Springfield recorded “Son Of A Preacher Man” and toward the end of the year it was released on the LP Dusty in Memphis, and it became the song that defined Wilkins’ songwriting career. It was a Top 10 pop hit in the United States and Number 1 in England and all over Europe. Unfortunately I don't think this got made Karen , I think it was a suggested show on a Muppet Show fan forum. Pity, as Dusty would have made a great guest on the Muppet Show. Thanks for this Clive did wonder , as am sure something I would have seen...like you say it would have been a laugh and yes a great guest..
My gardener who plays in a band just brought this souvenir programme for me ... you can check out Suzi Jari - 125th street London Show on google singing one of Dusty's songs. Last edited by karen on Sat Jun 25, 2011 12:50 pm, edited 2 times in total. Suzi Jari , who sings Dusty's songs..
A nice programme Karen, can't say I've heard of Suzi, not a fan of other people singing Dusy songs as you know, but I will check her out later. 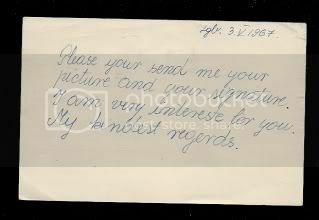 You guys have the best Dusty memorabilia.... "sigh"
as songwriters they provided Dusty Springfield with a small success in “Baby Blue”. But small success equals failure with Buggles and Trevor Horn, who writes most of the duo’s lyrics, says that he got no kick out of Dusty recording the song. “No-one ever records our songs as well as we can do them - I firmly believe that. Dusty’s ‘Baby Blue’ was a bit of a let-down because we had done a great demo. daydreamer wrote: ... but what seems more stark is her other admission that, in terms of making music, "it's important what they think and not quite so important what I think". I've read this critique before of what Dusty said and it's obvious the writer didn't understand what she was referring to - namely her habit of finding fault with every performance. When Dusty made this statement she had gotten to a point where she realized that she didn't have to be perfect and if the audience enjoyed the show maybe they were right and she was wrong. Far from being an "admission of defeat" it was actually a mark of professional maturity and self-acceptance. For anyone buying tickets for The Big Weekend, there's a Dusty tribute at Manchester Pride this year. Not impressed by the you tube performance. I think I sound more like Dusty than she does!!.. ..Why is it that peope think they can 'be' Dusty by just sticking a blonde wig on their bonce? This is definitely NOT Dusty!.. Just recently she has been cast a small part as a 'club singer' singing a Dusty Springfield song in a film due to be coming out in the cinemas....WATCH THIS SPACE! This is the first mention we've had about the film in quite a while. I thought she was crap too There are a lot of them around unfortunately. I don't think the reference was to THE proposed Dusty film, just that she has a part in a film singing a Dusty song. The voice isn't bad, but its nothing like Dusty, just someone singing her song. daydreamer wrote: I thought she was crap too There are a lot of them around unfortunately. I don't think the reference was to THE proposed Dusty film, just that she has a part in a film singing a Dusty song. That's what I read. Seemed a little shifty. Wonder why there is not more being said (entertainment media) about THE movie ? Probably because they are still writing the script and the last four announced biographical movies have imploded. I despair at this one as well because they are adapting Sharon Davis's book which simply re-told the false version of Dusty's life. Oh right... in a way I was taking this as a positive, thinking that the Dusty film must at least have been cast. Its all gone eerily and concerningly quiet on the film front. "Get a move on, Ray Connolly!".. Will Young praises Adele and favourably compares her to Aretha and Dusty. It seems Will Young is Adele's number one fan as he has compared her to iconic stars such as Aretha Franklin and Dusty Springfield. The singer, who released his new album Echoes this week, praised Adele in a recent interview for being successful for her talent alone. Speaking to the Daily Star, Will said: ''It's great seeing Adele bringing classic-sounding music back. Adele's basically taken over the world without using any gimmicks. She has a brilliant voice with brilliant songs and brilliant production." He added: "She has the same qualities as Dusty Springfield and Aretha Franklin. But she's also really honest and funny. Brits can sniff out dishonesty. I don't think we'll ever see Adele get up herself." I highlighted the word 'but' as I would have preferred it NOT to have been there...Dusty was honest and funny too wasn't she??.. Chalk it up to an off the cuff remark. You know sometimes you say things, and don't have time to edit yourself. I'm sure he meant well. "used to keep all my Dusty Springfield records on a plank on my wall, but since I sold them, I just don't know what to do with my shelf." TATM: What was recording “Son of a Preacher Man” with Dusty Springfield like? Brown: [Springfield] was crazy. We had seen [Springfield] once before in the recording studio and didn’t really remember her. When she saw us, she knew exactly who we were… That was cool. “Son of a Preacher Man” was originally given to The Sweet Inspirations to sing, but we declined it. We turned around, and look who had a hit… We didn’t particularly like the song… So we didn’t do it. had a mailshot from Amazon in USA this morning to say "heart and soul" cd was available on there for about $12. so if any of you out there havent got it then thats the best price I have seen it at for yonks. its a good cd so I dont know how many they have if anyone is interested they need to have a look asap. Whilst trying to find whether Dusty ever played the Liverpool Cavern I found this little snippet from one of the Cavern 'Regulars'.. The Beatles were the best band and we used to do the "Cavern Stomp" dance. One day Dusty Springfield came in looking for someone to do the brand new dance "The Twist” I was photographed with her doing the dance and it was published in the Liverpool Echo. I'm thinkin Dusty may have been playing at The Liverpool Empire (around the corner) and just popped into the Cavern for a 'Twist!'.. I already have a picture in my head. I hope someone can find the actual photo. I'd love to see the picture too Dusty said that The Springfields decided to split after seeing the Beatles at the Cavern and as the Twist was at it's most popular from 61-63, maybe Dusty's only visit(s) there were during that period. I think I may have heard or read that The Springfields did appear there as a group but I'm sure Dusty never did after she went solo. Thank you for the link Wend, I have seen or heard this story before, but its nice to see her talking about Dusty. I think I should take up throwing things! "Spooky" showed up several times on Twitter today, which was cool to see (in between tweets about songs like like "Who Gets Your Love" and "Something in Your Eyes"). Springfield's current album "A Very Fine Love" deserves far more attention than it has received up to this point. The gospel-spiced pop ballad could change all that, thanks largely to the empathy that the singer brings to its philosophical observations. After all these years, Springfield continues to be a peerless vocalist whose work should never be less than heralded in the muck-filled world of AC radio. Get with it, folks! CRITICS CHOICE (*): New releases, regardless of chart action, which the reviewer highly recommends because of their musical merit. Tell it like it is, Billboard! Where's the "Like" button again? Agree Carole, that would be one thing from FB that I could go with! Isn't it the truth ? Her last line says it all, "It's oddly comforting just knowing she's close at hand." And I like her choice "sampling" that line from Dusty's song. I was just about to post the online version of that as it appeared on Facebook today but it's even nicer to actually see it in the newspaper. Thank you Ken. Her blond beehive fills my tiny screen too. Carolyn (Borntoolate) posted the link to this on FB...how cool to see the physical article! Thanks for posting it Ken. its a fluffy piece but its sweet...and i like seeing Dusty on an iPhone. I guess this is what they call "USP", unique selling point. "And look, this phone even has DUSTY on it!" i phone users have impectable taste...she there on mine, together with Angry birds!! Take us with you on your journey of discovery, Ken! I love to read more about it. Can't have too much Dusty, right? Corinna wrote: Take us with you on your journey of discovery, Ken! I love to read more about it. Can't have too much Dusty, right? Too Much is Not Enough.. It is a nice complimentary piece, sorry I don't have scanner and it is not on their website yet. Thank you Ken, loved seeing this too, missed it till just now. great article..thanks Ken. It's so awesome to open a newspaper or magazine and still see something Dusty related. Yes this does take you back Clive thanks for posting .. . Just as well Dusty didn't wear them on the bottom lashes as well .. sleeping with them on as she did sometimes WOW.. If anyone missed Queens of British Pop first time around, it's on again on Sunday evening. BBC2 7.00pm. From memory, I think Dusty was first on. Yes she is Carole , worth watching , recorded it amongst others.. second clip shows her performances.. [ got her names in wrong order didn't she? I saw this pic of the Liverpool Empire where Dusty played panto in the 60s. Its being restored, and I thought gosh were we really so close to Dusty as we were on the very front row! The music from Doris Day, Connie Francis, Buddy Holly and Billy Fury feature in Memories Are Made Of Hits, a brand new show that brings together the most popular artists and their music from the nostalgic era of the 1950’s and 1960’s. Reminding you of the stars that created some of the greatest and most popular hit recordings ever made, including classic performers Elvis Presley, Dusty Springfield, The Shadows and Bobby Vee, this is a dynamic afternoon matinee that will leave you singing the songs for weeks to come. Lovely to think it is being restored Cas , and how close were you to Dusty WOW..
Nice to see the pic of The Liverpool Empire, went there when the first Dusty musical (the one with Mari Wilson)came out .Then it came to the Palace in Manchester... So obviously,we went again. I love the old theatres they have so much more character than the newer ones. If only those walls could talk!.. Great shot of the Empire and good that it's being restored. I hated that they let the Odeon in Manchester fall into decay, I had fond memories of Dusty, The Four Tops, Madeline and Sam and Dave there. Cas, I wonder why we didn't taken any photo's at the panto? Considering we went two or three times, you would have thought we would have. I'm not sure why we didn't as I know I had my camera for sure on one occasion as I took a pic of one of the Ryan twins, and also the poster outside. Maybe they didn't allow you to take photos. DW: When did you discover girls? SC: About seven. I had a crush on Dusty Springfield. Also, Raquel Welch. I had the One Million Years B.C. poster. But my first crush was a girl called Tara Miller and we snogged at the bottom of my garden. Simon Cowell being interviewed by David Walliams. Indeed! who would have thought it, but he had good taste. I found a couple of small pics of the Imperial where I first saw Dusty live on stage in the 60s. To say Nelson was only a small northern town, the Imperial had all the top acts including the Beatles and Dusty. The Imperial burnt down I forget the year, but on the site they built flats. Heres a couple of pics, one of Dusty with the stage manager and whoever else. You could dance right up to the stage and almost touch the artists. I thought something like this would have made a nice thread of its own if theres enough material from everyone? lovely Cas and a great idea for a thread I think. Yes, it was very nice to hear Dusty sing "Spooky" here, I haven't seen this before! Interesting with this Vintage collection, too! I haven't seen this before Karen, interesting collection, and a great song of course!